Cleveland now stands with a few select cities with Broadway Series runs of three or more weeks, including Los Angeles, San Francisco, Seattle and Washington D.C. The increase in performances will drive an additional 100,000 visitors into downtown restaurants and businesses. Larger audiences secure Cleveland as a premier venue with even greater ability to attract the best shows direct from Broadway! 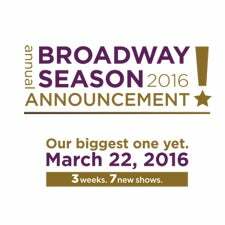 Even bigger… Annual Broadway Season Announcement. Join us online Tuesday, March 22, beginning at 7:30 pm, as we tweet, post, and share photos of all the BIG news coming out of the KeyBank Broadway Series Launch Event—LIVE—as it happens! As this is your Broadway Series, we want to know what you think about the exciting new season line up of shows coming to CLE! So, please tweet and comment right back to us using hashtag #BWYinCLE. This is more than an announcement, it’s a CELEBRATION, and we want to share it all with you.